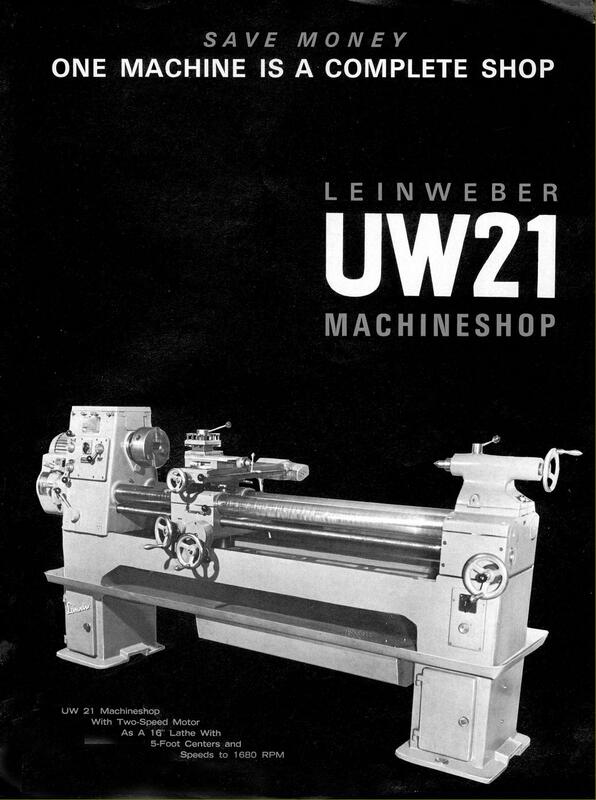 Designed by Ing Johann Leinweber, the Leinweber UW-21 Combination Machine was manufactured in Austria. It was conceived as an all-purpose device, able to turn, mill vertically and horizontally, drill, shape, slot and grind horizontally and cylindrically - with any one change of use requiring no more than four minutes to set up. Based on a substantial 8" centre height screwcutting centre lathe with a capacity of 60" between centres, it weighed a not inconsiderable 2860 lbs. The general construction of the machine was to a high standard with hand-scraped mating surfaces, 90 mm diameter hardened and ground solid-steel bedways, ball-bearing thrust races and anti-backlash feed-screw nuts. Cantilevered off the left hand end of the headstock, the main drive motor was a 3 h.p. 3-phase type that drove the 1.054" bore, No. 4 Morse-taper spindle via twin V-belts to give six speeds of 40, 80, 150, 320, 640 and 1300 rpm. A highly unusual feature of the machine was the ability to shorten or lengthen its bed by moving the headstock and bed rails as one unit towards the fixed No. 4 Morse-taper tailstock - the rails sliding through the tailstock's supporting base. At 24" x 7.2", the 3 T-slot cross slide was unusually large - as it had to be, substituting as it did for a milling and boring table without the necessity of having to be changed; its travel was also very generous, with some 12" of powered cross feed as well as 60" up and down the bed. The table was supported in the middle of the "saddle" on a 4.3" diameter shaft which could be raised and lowered through a range of 6"; hence, when used in lathe mode no packing was needed underneath cutting tools, they could be adjusted precisely to centre height by turning a handwheel on the apron. With infinitely variably rates from 1/4" to 2" per minute. the table cross feed mechanism was powered by a simple motor-gearbox fastened to its back edge - if a feed had been arranged from the leadscrew the mechanism would have been both complex and ultimately unreliable. A rod, which ended in a black knob at the front, ran along the right-hand side of the table and mechanically engaged and disengaged the feed. 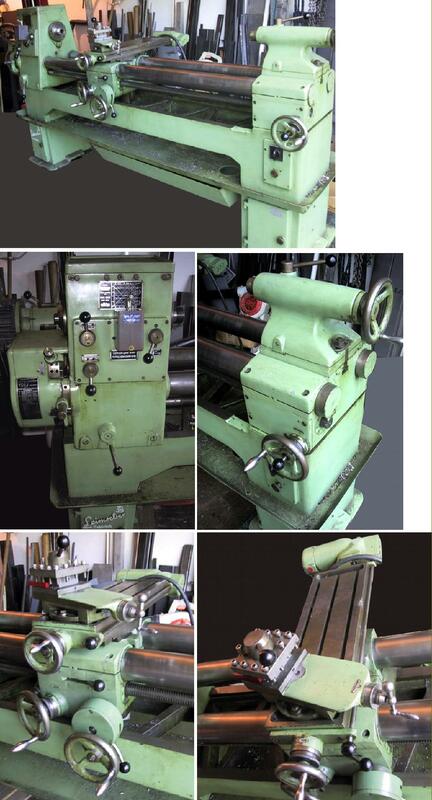 Supplied with the lathe as standard were: fixed and travelling steadies, a 15" diameter 4-jaw "faceplate" chuck, a 10" 3-jaw chuck, 7.5" 3-jaw chuck, catch plate, 2 hardened centres, 4-way toolpost, a horizontal milling attachment with a 1" diameter arbor 18" long and 2 draw bolts, a vertical milling attachment with draw bolt, a shaping attachment, chip tray and built-in coolant tank (but no pump). On the options' list was a Varity of useful accessories: a two-speed motor, toolpost grinders, built-in coolant pump, sensitive drilling attachment, flanges and guards for the surface grinder, an arbor and guard to mount a grinding wheel for horizontal use, Ruegg Drum Turrets and an adjustable-stroke drive for the shaper.. In this picture the headstock and bed rails have been moved towards the tailstock - the bed rails passing through the tailstock support casting. The bed movement was controlled by worm and wheel gearing, activated by a handwheel on the front face of the lathe immediately below the tailstock. Carriage assembly. The long "adjusting" slots in the casting on the mid-line of the bed rails are clearly visible. The column supporting the table can be seen rising from the middle of the saddle - it was controlled through a gearing mechanism activated by a single lever positioned on the lower right-hand front face of the apron. Note the use of crude hexagon bolts in the 4-way tool post. The horizontal miller set up required the insertion of an arbor end support (with an adjustable taper roller bearing) in the arms of the right-hand half of the saddle. lower: 40, 80, 150, 320, 640, 1300 rpm. The design allowed arbors as long as 60" to be used - a useful feature, possibly…..
With a suitable cutter holder installed this set up also lent itself to horizontal boring. A grinding wheel held in the Vertical Head being used in the "Blanchard" style. The No. 3 Morse taper Vertical Head had a maximum clearance of 8.375" beneath its nose and a throat of 8.5". Six spindle speeds were provided of 58, 116, 218, 465, 930 and 1880 rpm. Boring out a connecting rod big end with a micro-adjustable boring head.